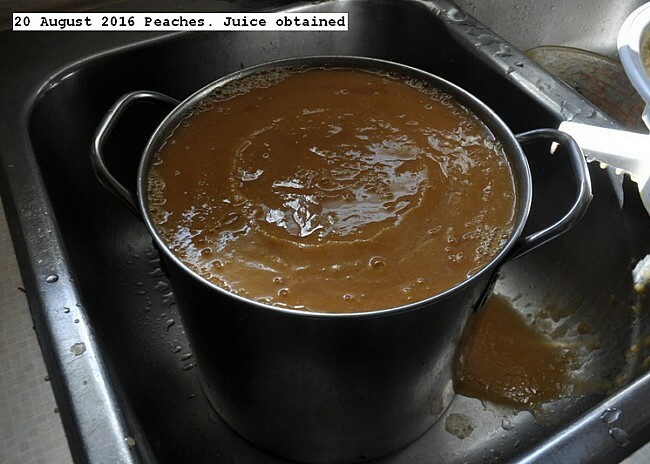 Sixteen pounds of peaches were purchased for $1.65/pound and made into 8 liters of juice. Seven were pressure canned at 15 PSI for 15 minutes for long term storage. Method of processing. Pits removed, covered with water about four liters, cooked until soft about 20 minutes, made into a slurry with hand blender, strained through a food mill of 2 mm screen, stored in liter jars for pressure canning. There is no residue of consequence with peaches, and straining is probably not necessary. The juice is most pleasant. This entry was posted in Uncategorized and tagged 20 August 2016 Peaches, Peach Juice. Bookmark the permalink.